There’s been a lot going on these last few several months here in the kitchen of three dogs. Thankfully, there are still three (mostly) healthy dogs crowding my kitchen space and hogging my couch. So, all is good on the pup-front. Someone told me that 2016 was a year of endings, as a “9” year (in numerology, feng shui, etc) – not necessarily a bad thing, just that cycles were coming to a close, events were completing, it signified a time of change. 2017 is a “1” year – new beginnings, fresh starts, open minds and hearts, and a year of possibilities. All I wanted to do was finish that race. I wanted that medal at the end (and the free banana, which was the best banana I have ever eaten, because OMG I ran 9 miles and climbed things forever!) and I wanted to prove to myself that I could challenge myself and actually do it. 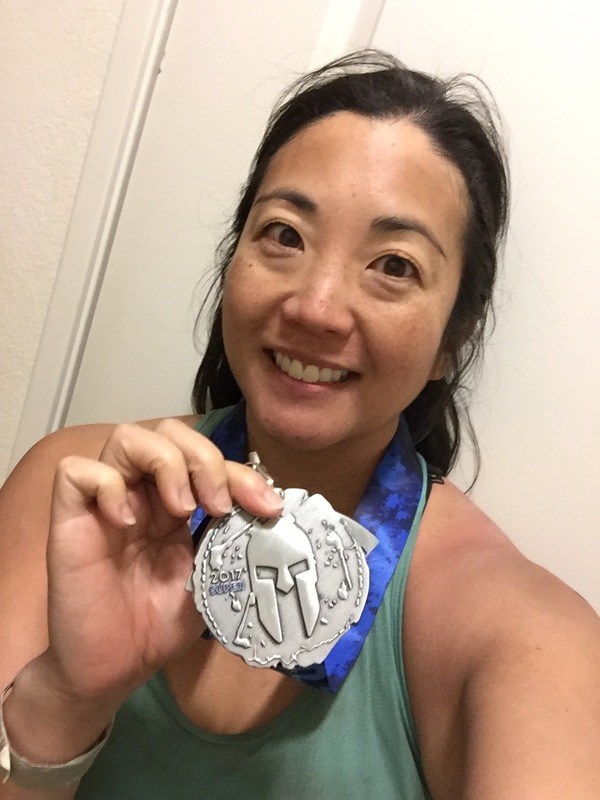 I had lots of help – people boosted me up, pulled me over, pushed me up and over, helped me keep pace, fed me a block of something that tasted like minty Red Bull in gummy form, cheered me on, and celebrated every step of the way. My sister never left my side and even shared my obstacle-failure Burpees with me. But I finished! I made it to the finish line in one piece, I attempted every obstacle and even completed a good majority of them. I learned I am strong and determined and absolutely terrible at throwing a poorly weighted spear but give me a bucket of rocks and I am fantastic. So, as I keep chugging along through 2017, this is the kickoff that I will remember; the challenge that I will keep in my pocket of victories. One of the reasons I threw myself into something new and different and slightly terrifying is because, while Three Dog Kitchen is still full of fur, it is down one human. If I’ve seen you in the last few months, you probably know, and I hope you also now know that I’m doing okay. I will not pretend that our split was mutual, and I will completely own the fact that I’m the one who initiated it. I do not regret anything that has happened in the last 10+ years; I am a little nervous about what’s to come but I am optimistic that life will continue to be fabulous. Because that’s who I am. My life is an open book. There is no question you can ask me that I will not answer, and I will probably give you more than you want to know. Don’t be sad for me, be excited – I’m ready for so many adventures to be thrown at me. Also, very available for lunch, happy hour, drinks, dessert (definitely dessert) and time to catch up! And, taking recommendations for future dates. Because a girl still needs to be swept off her feet and fed ice cream. Making a big life change is scary. But you know what’s scarier? Regret. It’s great you are willing to face the future you want.